This morning has been one of back-patting and thanks to officials and police for all the hard work put into this weekend&apos;s NATO events. Like all things in Chicago, there are knowns that go unsaid, and the big ones are thanking the police officers for not evoking scenes of the &apos;68 Democratic Convention, the protesters for not burning down the South Loop and to residents for dealing with the Doom&apos;s Day scenarios the media have been girding for. 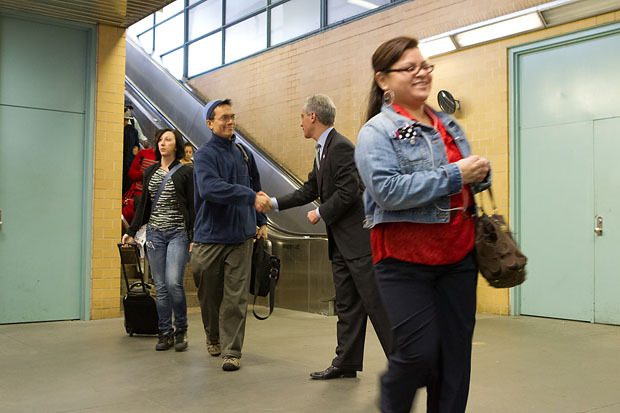 As a final thank you, Mayor Rahm Emanuel stopped by the Roosevelt &apos;L&apos; stop to greet commuters this morning, and thanked them for the "hospitality they showed world leaders, journalists and visitors during the NATO Summit." We&apos;d like to invite our readers to give their thanks to the officials for NATO. Feel free to caption this photo in the comments below.